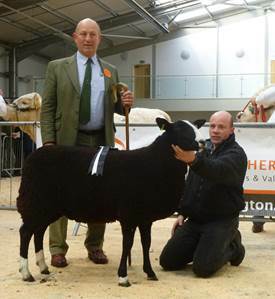 The in lamb sale at Carlisle on the 22nd November 2103 topped at a fantastic 1500gns for a ewe lamb lot 305 from R Heigh Bentham. This very smart and well grown lamb Brookdene Ann also stood reserve overall champion on the day and eventually sold to C Milburn's Norton flock Malton N Yorkshire. In Lamb sheep topped at 780gns for the overall show champion lot 260 Elidon Hill Wait 'N' See from S Craig Melrose and sold to D Moir's Cairness Flock Aberdeenshire. Lot's 248 and 249 topped this section at 650gns and 525gns and were from J Scott. These were very correct ewe's and lot 248 Scottfair Tamsin sold to N Henderson's Aquilia flock Stirling whilst lot 249 Scottfair Tabitha sold to C and H Duffy's Smiddy Hill Stranraer. 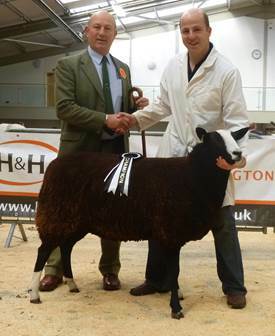 Then at 420gns a ewe from GA and HM Francis lot 236 Abbots Grove 032T sold to D Robinson Cockermouth. Out with the top of 780gns mentioned for lot 260 from S Craig above lots 262 and 282 from C Anderson and M Simpson both sold for 500gns. Lot 262 The Fort Whipple sold to J Irvine's Mill Thorn flock Tow Law while lot 282 The Fort 105W sold to M Monkhouse Wigton Cumbria. Lots 272 and 283 reached 480gns the first from GA and HM Francis Pistyll 431W sold to WJ Watt Banchony and the second lot 283 from G MacIntosh Ardanbeag Wee Rona selling to JJ and M Robinson Newton Stewart. Well grown smart ewe lambs were in demand and out with the day's top price of 1500gns from R Heigh's reserve champion next was at 1000gns for lot 356 from M Simpson Tardoes Ace Sarah selling to WR and JE Dixon Aspatria Cumbria and next at 580gns was lot 318 from J Thorburn Holmlea Ash this sold to K and S Cowin's Hellstanes flock Lanark. Non mv ewe lambs from M and B Lightburn's Norville flock Penrith lots 357 and 358 sold to 140gns each to A Porter Stoke On Trent.